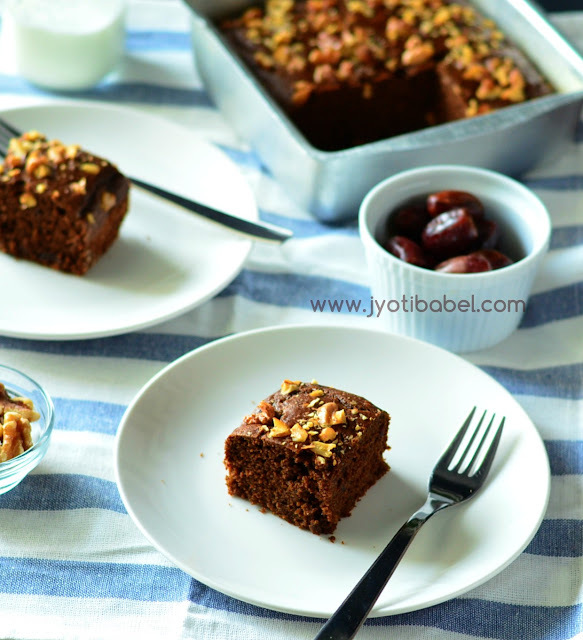 Whole wheat dates & walnut cake, as the name suggests comes with the goodness of dates and walnuts. In this particular bake, I have gone a few steps ahead and have replaced the sugar with jaggery granules and butter with oil. And yes, there is no refined flour used. I got the bug of baking healthy from my dear friend and blogger Bhawana of Code2Cook. 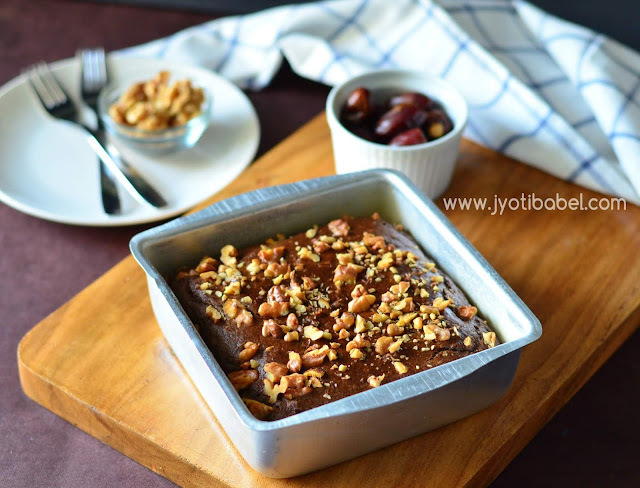 She has a penchant for baking with healthy and non-refined ingredients. I am a fan of her spiced pumpkin bread. The school holiday season is upon us - so you know when the kid is around at home all the time you need to have something handy to serve as snacks. I try to serve my kid healthy and homemade stuff as much as possible (of course, there are cheats days). This cake is just one example. I have noticed that my boy doesn't mind whole wheat cakes (completely opposite my DH). So, I have all the more reason to bake one for him. Whole wheat dates and walnut cake makes for a good snack – you can have it in the morning with a glass of milk or with your afternoon cup of tea or coffee. Before you set out to try this recipe please take note of a few things when baking with whole wheat flour. Whole wheat cakes tend to be a little denser than their refined flour (maida) counterparts. If you want to try this recipe with maida, just keep in mind that whole wheat will absorb more liquid than maida so you might need a little less liquid than mentioned in this recipe to get a pouring consistency batter. Whole wheat cakes taste somewhat different than refined flour cake. That is the reason I never bake it plain. For example, here I am using dates and cocoa powder to mask the taste of whole wheat. If you are not sure about baking with whole wheat yet, try half whole wheat and half maida to start with. 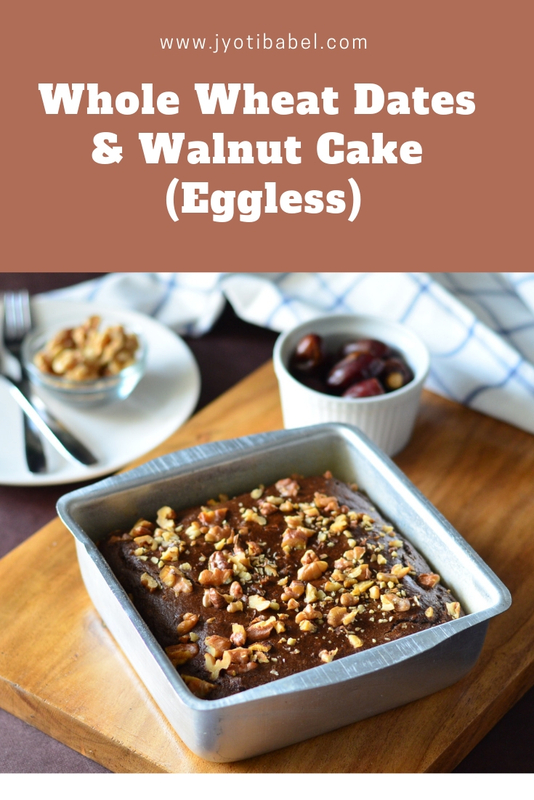 Let's check out the recipe for eggless whole wheat dates and walnut cake now. 1/2 cup pitted dates (About 15-18 soaked in ½ cup water for 2-3 hours). 1. Grease a 6-inch or 7-inch square cake tin and dust it with flour. Invert it and dust off the excess flour. Preheat the oven to 180C. 2. Grind the dates along the water and milk to make a smooth paste. 3. Sieve flour, baking powder, baking soda so that it is uniformly mixed. 4. In another bowl add the jaggery granules and the dates paste and whisk well till all the jaggery granules melt. Add oil and whisk well again. 5. Slowly add the dry ingredients to the wet ingredients. Stir well and then whisk lightly to form a batter. If needed add some milk or water to get the right pouring consistency of the batter. 7. Pour the batter into the pre-greased tin and bake at 180 C for 30-35 mins. 8. 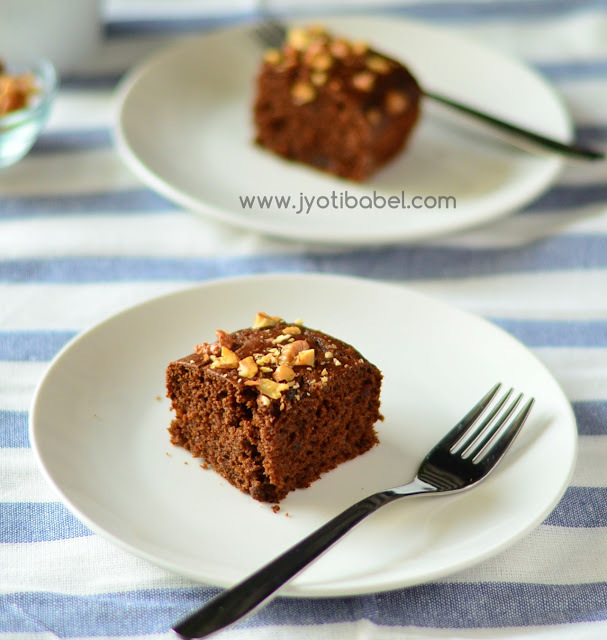 When the cake is perfectly baked, a skewer inserted in the middle of the cake will come out clean. 8. Let the cake rest in the tin for 5-10 mins before turning it on a wire rack to cool. 9. Once it is cooled completely slice it and serve.